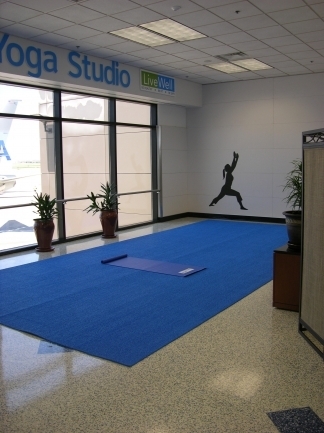 Terminal B Yoga Studio is located within the DFW International Airport. The studio affords travelers the opportunity to relax their body and mind before embarking on their next journey. Established in 2012, the 24/7 studio resides near Gate D40 in the hallway connecting Terminals B and D. James Dixon serves as the Terminal Manager at DFW International Airport. In this role he manages the physical, operational, and aesthetic conditions of the terminal facilities and its surrounding areas. 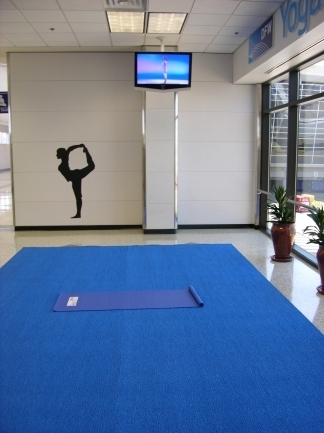 In an effort to promote healthy living, the DFW International Airport decided to construct a yoga studio. While the size of the space was more than ample, the terrazzo flooring was less than ideal for performing yoga exercises. With the safety and comfort of travelers in mind, Dixon began his quest to find flooring that would ensure these conditions were met. A hard surface can present many challenges for anyone looking to perform yoga exercises. It is vital that the surface is not only cushioned but slip-resistant too. When wet, terrazzo flooring can become slippery, creating an unsafe environment for yoga practitioners. Aside from being slick, a hard surface can cause bruising, creating potential physical ailments down the road. 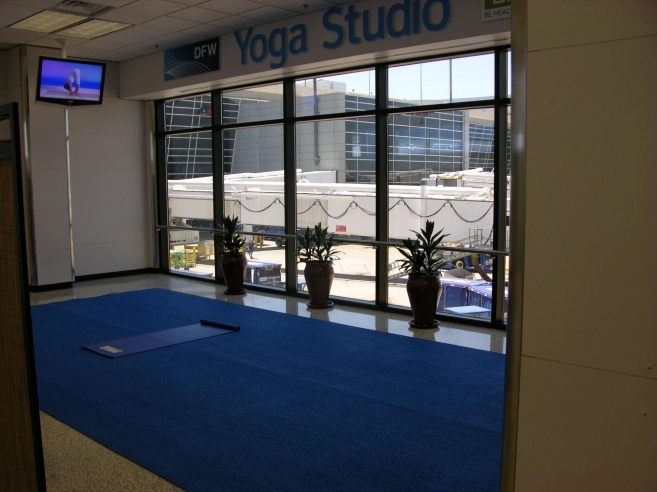 In short, The DFW International Airport was in search of flooring for the Terminal B Yoga Studio that offered comfort, safety and ease-of-use. Dixon saw an opportunity to select a product that would fulfill all these needs at once. Additionally, Dixon wanted a surface that was durable, thus reducing the operational costs of the studio. PEM Surface Creations provides slip-resistant matting solutions to a variety of industries including: aquatic, kennel, golf, equestrian and playground. PEM Yoga Flooring offers a wide range of benefits over traditional yoga flooring. The soft construction provides comfort to bare feet, creating a more relaxed environment to practice yoga. In addition, the textured surface will help limit the chance of slips and falls in wet conditions. Because PEM yoga flooring is easy to install, the operations crew was able to seamlessly complete the installation process. As always, if a question or concern came up, a PEM representative was simply a phone call away. The Terminal B Yoga Studio has been using PEM Yoga Flooring for almost one year and the results have been nothing less than great. The surface, which is soft and permeable, provides barefoot comfort that will not absorb moisture or retain odor. In addition, Dixon was pleased to see that the flooring was available in multiple colors, ensuring that the aesthetics of the studio would not be compromised. The matting has been a huge hit with staffers and travelers alike. Dixon is delighted to see that so many travelers are embracing the new yoga studio. The PEM Yoga Flooring is lightweight and easy to remove, making cleaning time a real breeze for custodial staff.